This week's Cat Friday installment is a special guest blog edition by Inlander graphic designer Ali Blackwood Mead. 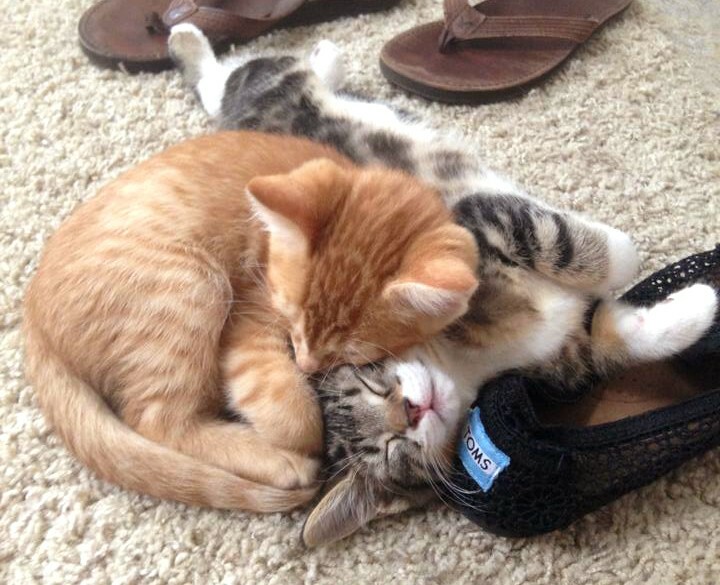 There is nothing better than kittens. As a cat owner who raised two lovely cats from babyhood, I sometimes long for the days when they were nothing but tiny purring balls of fluff that could fit in the palm of my hand. Unfortunately, they don't stay tiny forever. So how does one continually fill his or her house with kittens, without ending up the subject of an episode of animal hoarders? You become a foster parent for the Spokane Humane Society! There is a period of time each year known as "kitten season" that spans several months from early spring to early fall. During that time, when many female cats become pregnant and give birth, hundreds of litters of kittens are brought to local animal shelters — resulting in far too many kittens and cats for shelters here and all over the U.S. to house. Some of these kittens are motherless and need bottle feeding, and some are skittish and need regular human handling to help develop their little personalities. Having them in your home gives them the love and attention that shelters don't always have the time or resources to offer. Raevyn West, another Inlander staffer, and her boyfriend Jordan Welsh are on their third batch of foster kittens this year. Their adult cat, Thunder (also a Spokane Humane Society alumni), loves having an endless supply of kitten playmates in the house. Raevyn and Jordan always go the extra mile for their kittens, giving them epic names (William Wallace, Anubis, Thor, and Highlander, to name a few) and lots of love. The couple also has found permanent homes for almost all of their previous foster kittens before the fostering period is over. Oliver and Thor were siblings from Raevyn and Jordan's first litter of foster kittens. At the moment, Raevyn and Jordan have two little houseguests, named Apache and Katniss. They are both sweet, adorable, and available for adoption. The kittens will be fixed and ready to take home in mid-October. If you're interested in adopting one — or both, they're best buds! — send an email to RaevynW@Inlander.com. 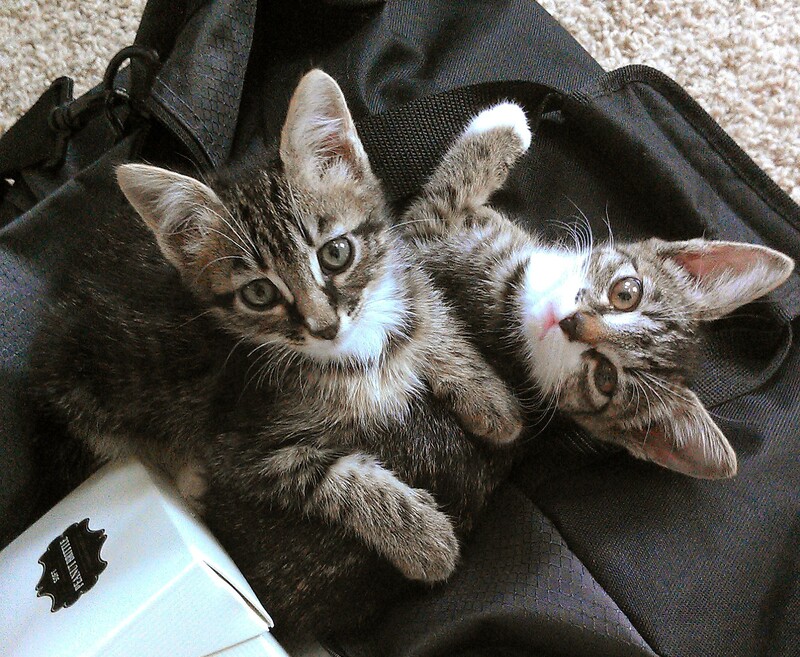 Current foster kittens, brother and sister Apache (left) and Katniss (right), are currently in the market for a loving home. To foster, simply fill out an online application and you'll be contacted to go through a short training session. Once you're in the foster parent database, you'll receive a phone call or email whenever there is a litter of kittens (or other animals, depending on your preferences) in need of a temporary place to stay. Then you'll arrange to pick them up at the shelter, along with their supplies; food, litter box and blankets are provided to you with each foster group. 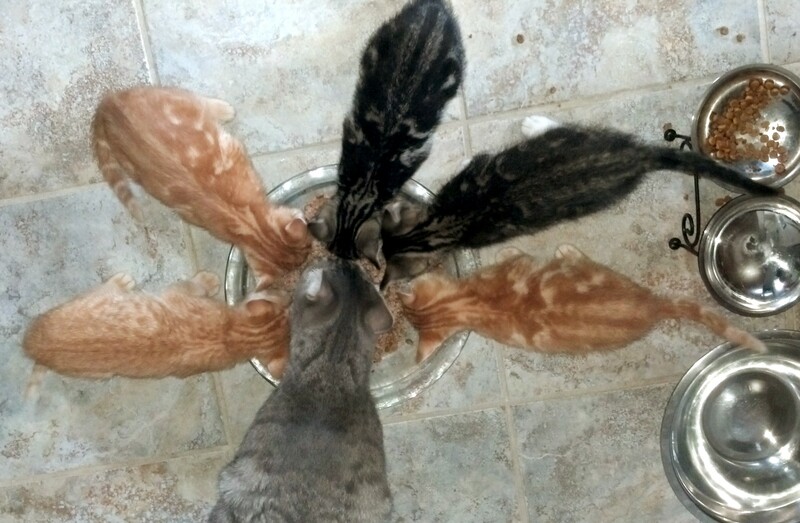 Raevyn and Jordan's cat Thunder (bottom) enjoys dinner with his five foster kitten friends. I asked Raevyn what the best part of being a foster parent was. "Well obviously having kittens around is great," she says, "But feeling like you can do a small part in helping them find good homes, and knowing the homes they are going to are people who will take good care of them" is also what makes Raevyn and Jordan keep coming back for more foster kittens. You can, of course, also foster dogs and puppies. But that's a story for Dog Monday. 10. You get to assign every awesome cat name you've ever thought of to an adorable kitten. 9. Your Instagram feed will become a million percent cuter. 7. Seriously. Look at this face. 6. You get to enjoy being your social circle's "kitten hookup." 5. Your adult cat will have tons of little buddies to play with. 4. Have you ever woken up with five tiny kittens all sleeping on your pillow? Epic. Cuteness. 3. 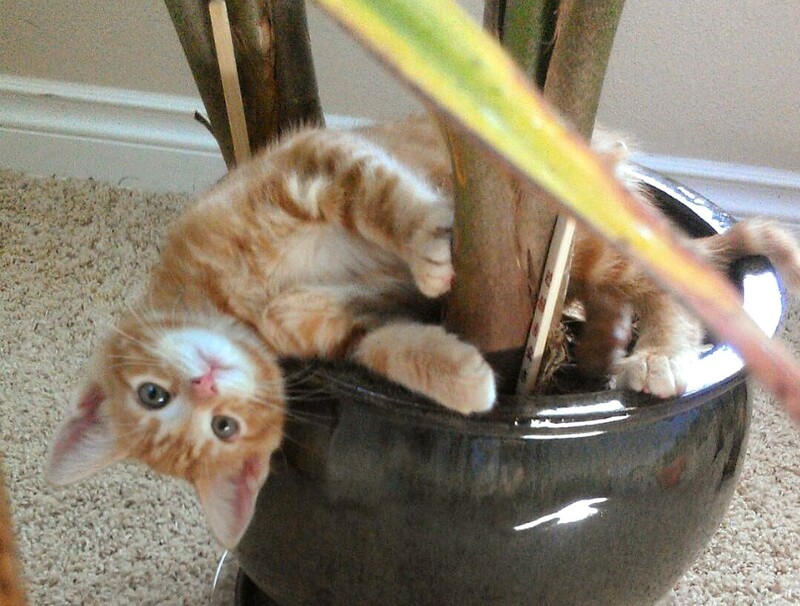 You can get a regular "kitten fix" without becoming a crazy cat person. 2. You'll be providing a valuable service to the Spokane Humane Society and the community. 1. Did I mention... KITTENS? 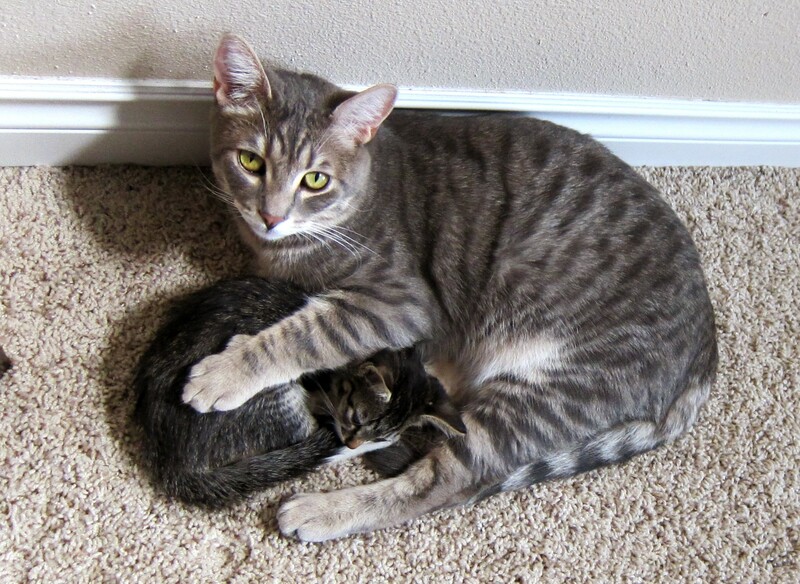 Thunder loves having rambunctious, cuddly kittens around the house to play and cuddle with.